Fears of an economic slowdown eased a bit thanks to a strong job growth report and better-than-expected new vehicle sales. Job growth rebounds: Job creation rebounded in March from anemic growth in February, relieving fears of a more dramatic slowdown coming in consumer spending. Average monthly job creation so far in 2019 is 180,000 jobs, more than 40k less than last year, but still solid growth. Unemployment rates remained steady while wage growth slowed slightly in March. Fleets boost new-vehicle sales: New vehicle sales in March were better than expected only because of fleet sales. Total new-vehicle sales were down 2% from a year ago. Cars declined again but at a less severe pace than in February. Fleet sales were up nearly 5% from the year-ago March. Commercial fleet sales were up the most, followed by government and rental sales, respectively. So far this year, new vehicle sales are down 2%, with retail sales down 4% and fleet sale up 6%. Incentives, inventory steady: Average incentive spend increased by 2% in March over February but was down 4% from a year ago. The days’ supply for March was 68, about the same as a year ago. With production cuts, automakers are keeping supply relatively controlled and thus they have no reason to expand incentives. Car days’ supply came in 6 days lower than last year, but truck days’ supply was up 3 days. 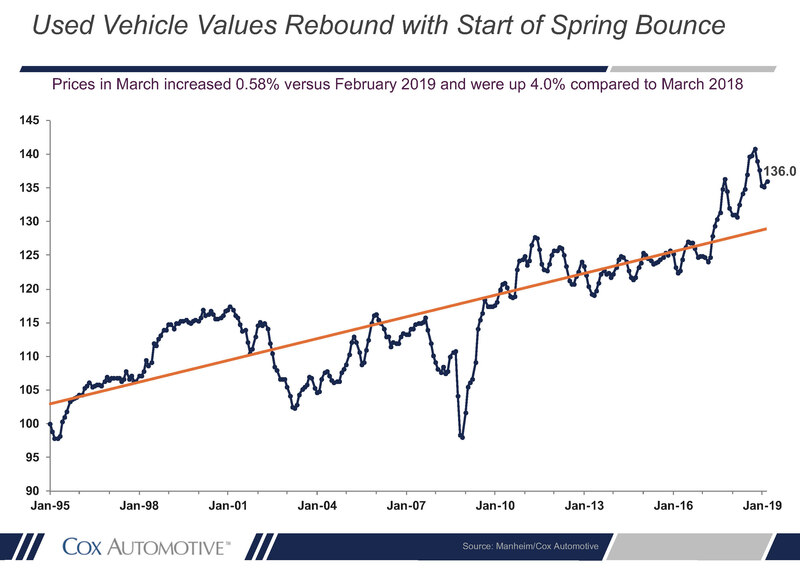 Used vehicle spring bounce: Used vehicle sales were also down in March, but a spring bounce is in sight, especially on non-luxury vehicles. Certified Pre-owned sales jumped in March, up 3% from a year ago. The Manheim Index increased in March as the spring bounce produced weekly price gains in aggregate. Consumer credit grows: Consumer credit grew more in January even though auto loan growth is at best flat. Credit card balances grew more in January than the softer growth in December. Tax refunds down: Updated data from the IRS continues to show that refunds by all metrics are down from a year ago. Total refunds are down 2% in number and down nearly 3% in dollar amount. Looking ahead: This week, we’ll get March consumer price data, minutes from the March Fed meeting, a preliminary reading on April consumer sentiment and updated tax refund data.